We threw a party for Lottie's Christening in November. I sold it to the hubby on the understanding that "she'll be two soon, it can double up as a birthday party". We had a fab party with Grandma's chicken, Grandma's Jollof rice (has to be tasted to be believed) and Grandma's coleslaw (to die for). I helped her cook it all which was a good initiation for me and about time too considering I have been with my Nigerian husband for 29 years now. We spent Saturday evening cooking (after me, Lottie, Aaron and his cousin spent the day at Noah's Ark and Daddy and Grandma spent the day sourcing ingredients). We just ran out of time to make plantain unfortunately. It was a wonderful party with a DJ and everything. Everyone left with smiles and full tummies and I had a few PJ days after meaning Christmas prep was ever so slightly delayed. ...Lottie with her God Mother. Fast forward not very many weeks, when I had more or less recovered and an email slid into my inbox from Talk to Mums. I saw that you could apply if you were throwing a party and the time-frame in which you had to do that in to qualify, coincided with Lottie turning two. I.could.not.resist. and couldn't apply quick enough even when the lower age limit was three years of age. I saw it as serendipity that the dates were in harmony and the visuals of the show stopper cake really got me excited. A Princess cake for MY Princess! Seems like having a party is like having a baby. 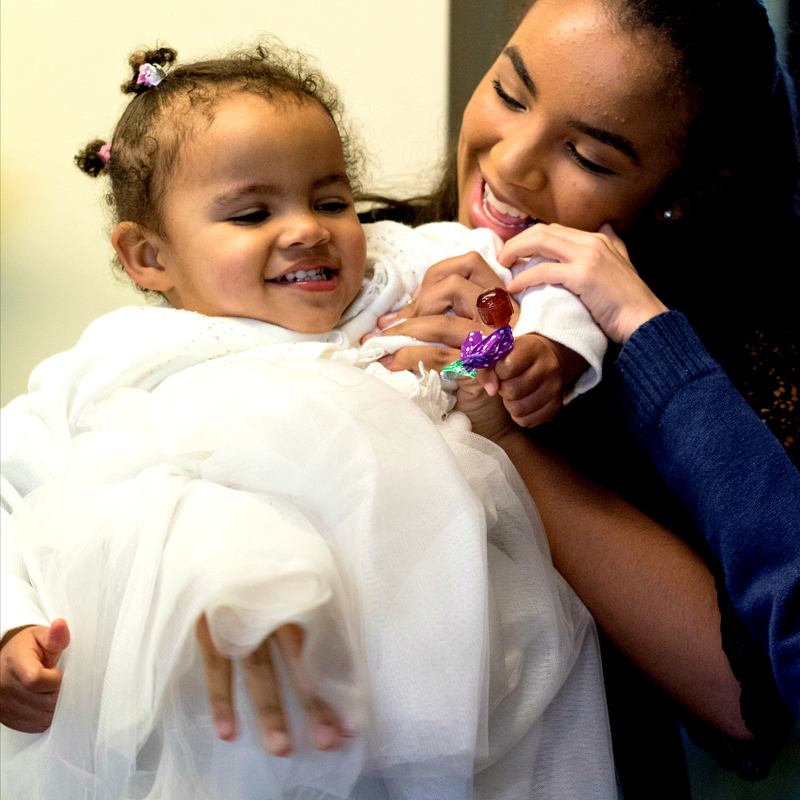 You have one, say "I'm never going through THAT again" and no sooner have you recovered than you are raring to go again, for that high and excitement that is hostessing to your favourite people for your favourite little people. 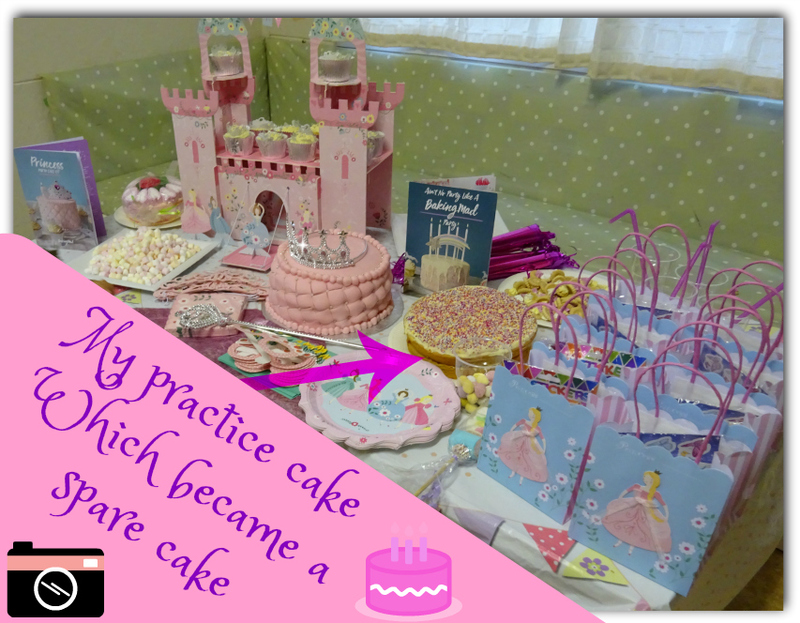 So there I was, all set to receive a Princess Party Cake Kit, from Talk to Mums' client Baking Mad, except realisation slowly dawned that I have never in my life, "never have I ever" actually baked a birthday cake. I am strictly a shop-bought-cake girl all the way. 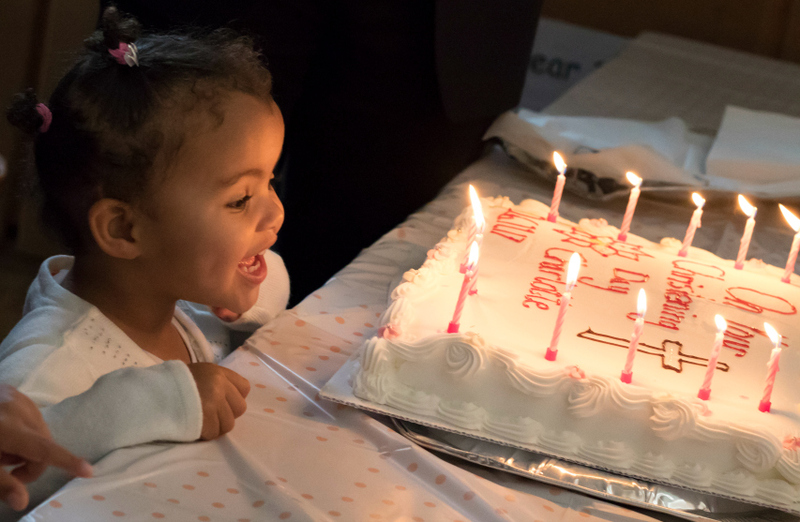 That Christening I mention above.... the cake was from Costco... I didn't even order it in time for them to personalise it, so we had to buy writing icing and the God Mother kindly and creatively obliged. The Talk to Mums' Baking Mad campaign was nationwide, with about 54 of us Mums in total, all anxiously waiting to see if we could cut the mustard. I think the less vocal amongst us were quietly, confidently and simply, biding their time till their skills, and their photography, could really showcase what they could do! That's the thing, the cake kit *is* suitable for both novices and experienced bakers alike. The logistics let us down a little though and I received the cake kit on Thursday 25th (ironically Lottie's actual birthday) for her party on Saturday 27th January. Nerves kicked in on whether I could actually pull this off but look what happened next. Now you could consider this cheating (my friend mixing the cake), but it is not. My deal with Talk to Mums and Baking Mad wasn't that I would get assessed on how well I could, personally, bake a cake, although it is of course implied that you are, the blogger, indeed showcasing how easy it is to make a cake from a cake kit and turn it yourself into a showstopper without the expensive prices that normally accompany that. Anyway as it turned out I didn't "cheat" if there is such a thing. What happened? Well me and my friend chatted as she mixed and I took photos. 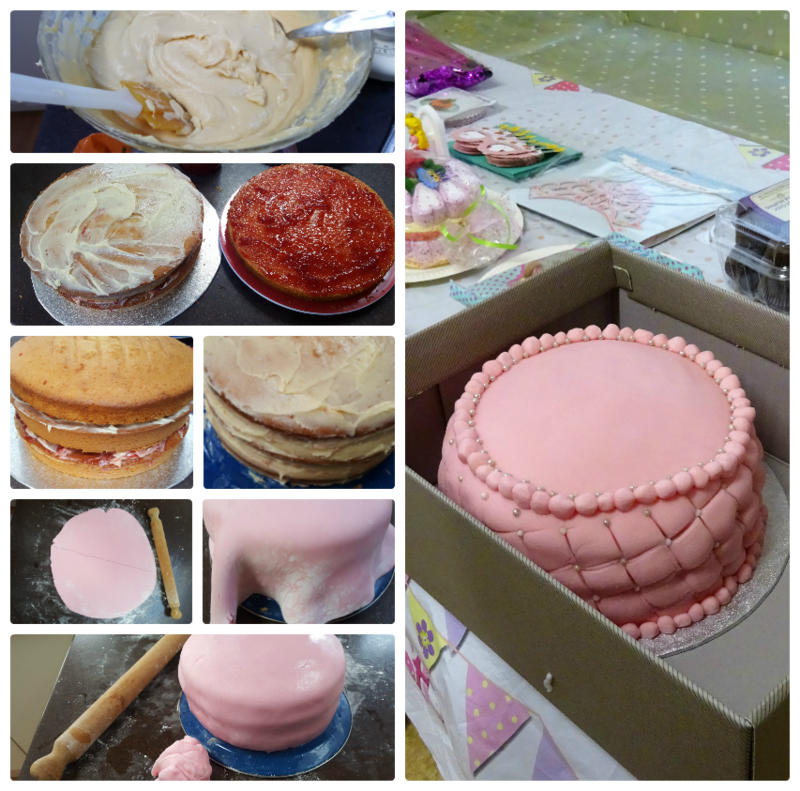 Although, anxiety being at this point at peak levels, meant that my photography wasn't at all at its usual standard, to the degree that I took a pic of the cake kit box of ingredients and didn't even include the pink fondant icing. I'd put it on the windowsill hoping that the direct sunlight pouring onto it would warm it up. I'd had it since the day before in deep mid Winter and was in a slight panic that being it was like a brick I'd never be able to actually roll it out. As it turned out, this didn't even pose an immediate problem and something I hadn't even considered DID! Which was that the butter should be soft and all of mine were straight from the fridge AND I didn't have enough of it. We'd asked for a couple of weeks, in our Facebook group, what we'd need to have in, at home, in time for our delivery and nobody had said we'd need 3 sandwich tins, and HEAPS of butter and two kinds of eggs (large and medium). Luckily we did start to get answers when Mums who were earlier on in the process started to bake theirs but I didn't quite glean or appreciate the sheer volume of butter required. I best get to the bit where I didn't cheat as I still haven't explained. So my friend raided my fridge for the 400g of butter required to make 3 Victoria sandwich cakes. I'd only bought one 250g packet for actual baking. So the rest of what she used was spreadable butter that would usually be used for toast. She mixed the cakes with her electric mixer which took way longer than it ought to have done as the butter wasn't softened. The wee little engine in her little hand mixer started to struggle. Once she was confident I was okay and the hour she could spare had been exhausted, she said goodbye and took her youngest off to pre-school. Only... just before she left... I got a text message on my phone that shook me up, ironically connected to this project as it was a friend wondering why she had not been invited to the party. I went back to the kitchen after seeing my friend to the door. My first mistake was that the instructions say to bake the cakes for 25 minutes but I set a timer on my phone for 15 minutes so that I could check on them. You're not really meant to do that as the heat escapes when you open the oven. Anyway luckily I have 2 ovens - a top small one and a bottom large one. I was anxious that the top oven, being small, cooks things quickly so when the timer alarm went off I took that top cake out to check on it. It was browned on the outside but gloop in the middle. 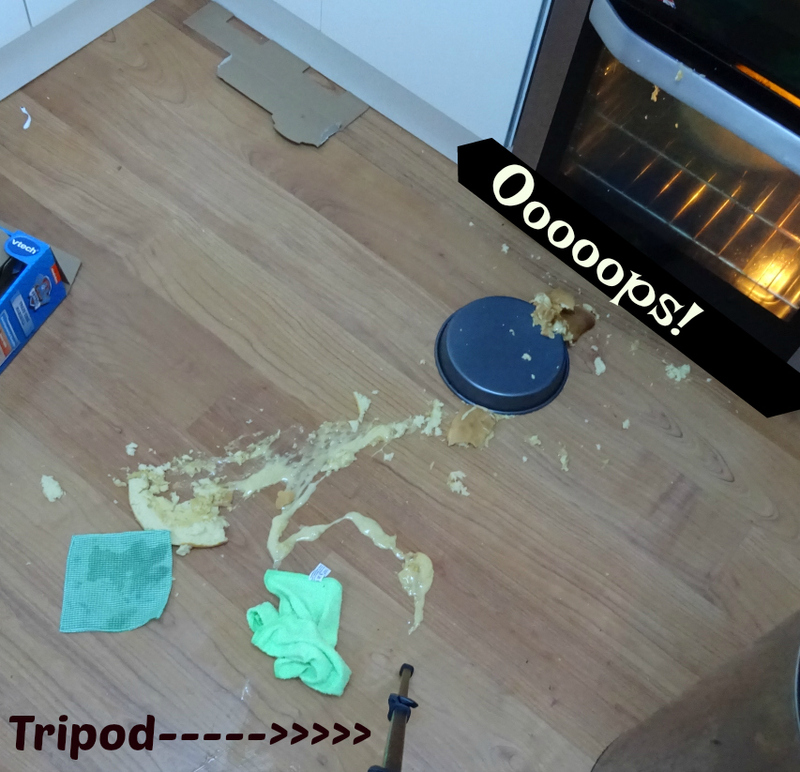 My tripod was in the kitchen for these amazing photos I wasn't going to take (just look at the above pffft!) and just as I took the cake out Lottie collided with me, with my own tripod. When I am composed I *can* juggle, which means it wouldn't have been an issue but alas, being that the text had shook me up, I dropped the cake. We all know, as a Mum when you juggle stuff you're not meant to drop anything, least of all an actual cake. ... feedback Silver Spoon should take on "board"
It kind of irks me that the cake board we actually received is a fifth of the width (just a guess) of the one they feature onsite as above. You can see the "economy" Sweetly Does It one we received in my photo of the cake kit above. 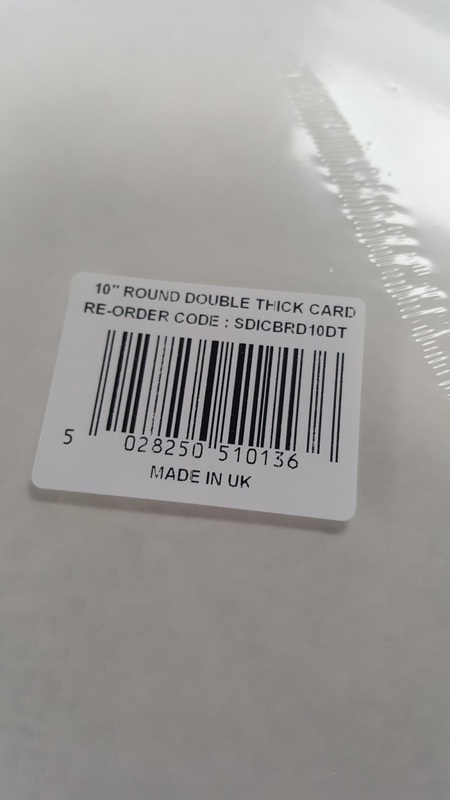 Irony of all ironies the bar-code label on its packaging said "double thick card". The Baking Mad "what's included" section says simply "cake board" when what you are in fact receiving is a 25 cm round cake board from KitchenCraft that is in fact 3mm thick. I don't have to tell you that that is not even half the thickness of what is photographed. Considering it is an ingredient that is seen and not simply baked and consumed, I think this is feedback Silver Spoon (aka Baking Mad) should take on board <<< forgive the pun!!!! Ha ha! Actually it's not funny it's tragic. #FirstWorldProblems and all that! 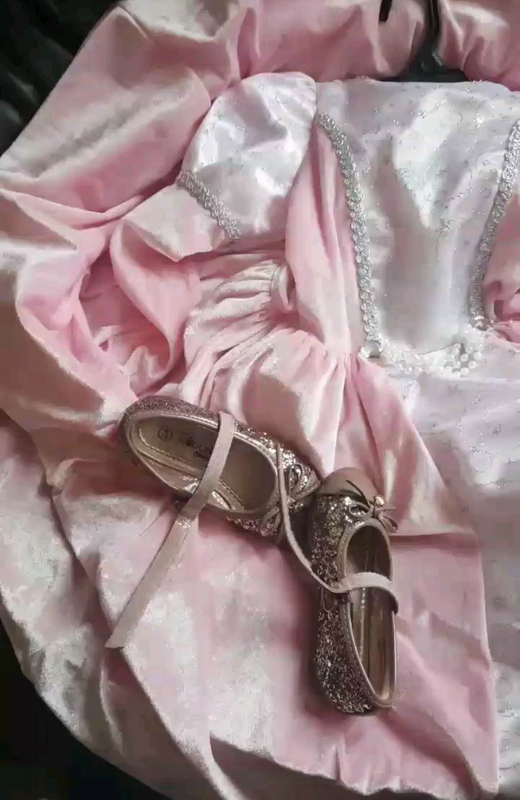 Luckily I bought Lottie a Princess Party dress from TK Maxx a few weeks ago and it spookily came with nothing more and nothing less than an actual premium looking tiara and wand. At that point I still thought we'd receive ours with our cake kit so I thought Lottie would have one set with the other being on the top table. But instead she had to forego wearing the tiara and playing with the wand so that they could be in the photos to "get the look" I'd dreamed of since applying for the project and having it confirmed that I'd luckily secured my desired Princess spot and hadn't been given "Peter Rabbit" "Pirates" "Unicorns" or "Super Heroes" as much as Aaron would have loved the latter. When putting the second cake on top of the first I did the jam and buttercream on the same layer. Rather unattractively and messily they mixed. I knew it wouldn't be seen as the cake would have a fondant icing jacket on, but I am a stickler for detail. With the school run looming there was no time to consult the wisdom that is Google, to see what hack ordinary bakers do, so what with this tall cake having the prerequisite of THREE sandwich tins I had another layer to do and as above you can see I had the good sense to do jam on one side and buttercream on the other akin to what you'd do if you had more than one ingredient in a bread sandwich of the savoury kind. It worked. I was happy. I got all of the above (bar the rolled up balls you see on the cake in the box above) done before the school run. It wouldn't have been possible had Lottie not been asleep but I benefited hugely from the heaven sent fact that she was. Ironically I have my back up against the wall right now, trying to complete THIS here blog post also before the school run. I asked experienced bakers how they got the walls of the cake to look as straight as that featured in Baking Mad's literature and they said they trim the cake. I'm not sure what they use to do this, but I didn't do it. 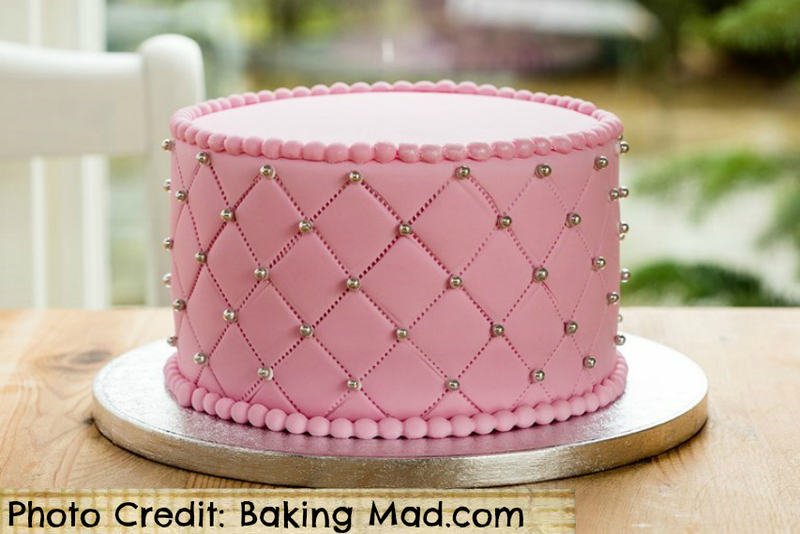 It means my cake looks like a real squishy quilt than a sterile perfect one. I am glad as it looks more homemade than professional which means I got lots of praise from my guests for making it rather than them assuming I had ordered it or bought it. I was dead happy with the result. 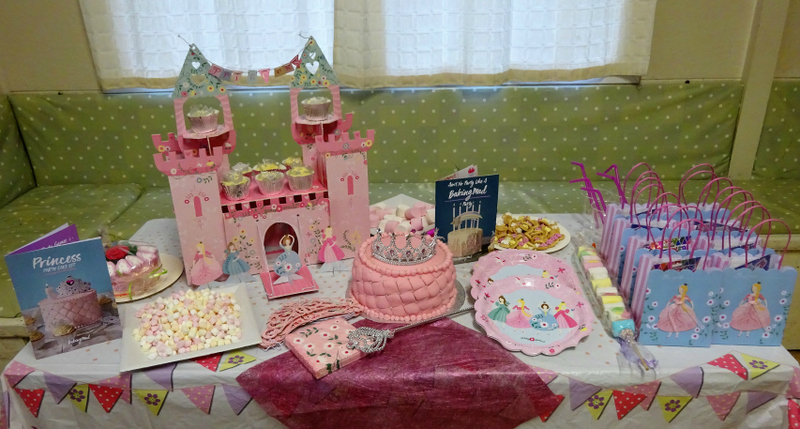 As bloggers we were sent everything in the Princess range, including things that can be bought separately from Baking Mad and not just the cake kit. As above you can see the Tiaras, that can be worn by your Princess guests, napkins, paper plates and the ever so stunning centrepiece castle, which I am yet to put the cupcakes on when I took the pic above. As you can see I stuck to the plan of adding our tiara and wand to get the required look. We were also sent Princess Party Bags (as gorgeous as these are they are empty and I spent a massive £25 to fill them), so bear this in mind when budgeting for your party. The finished look was as below. I was so very proud of the result. Although the castle centrepiece has to be built as it is delivered flat packed it is very easy to do and I didn't even need to consult the instructions. Do allow time for threading that Princess bunting you see above. I made the mistake of doing this at the party at a time when I really ought to have been laying out all of the savoury food on that table. Instead I did the bunting before everyone arrived, needing a sharp scissors when the thread started to fray and was no longer sharp enough to feed through. It meant lovely mum friends helped me lay out the savoury food when I really should have been mingling but I did get to boogie later - I used the same DJ as I did for the christening. It was an extra expense and means I only break-even (if that) from this project but at least it means Lottie got a birthday party she wouldn't have otherwise had, (and amazing presents) our guests got a great afternoon out having lots of fun and both the Mums and the small people got goodie bags. 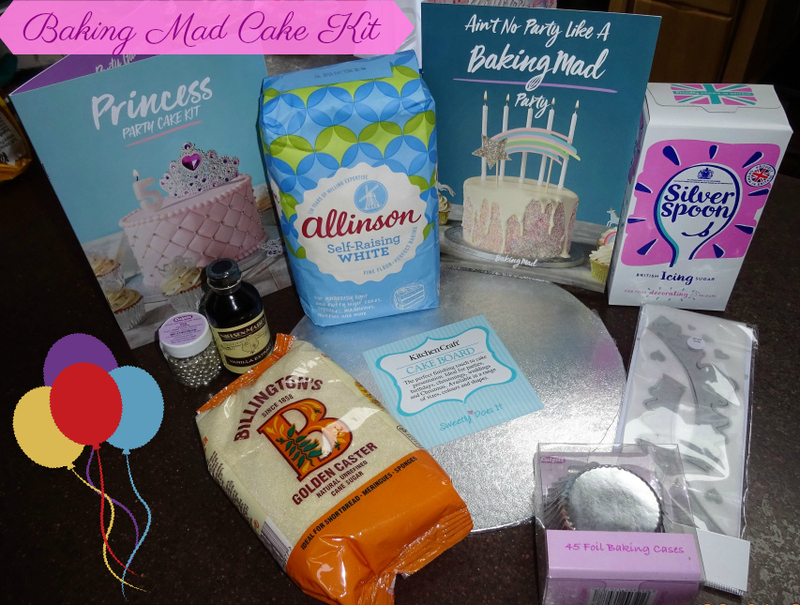 I purchased Princess ones (the contents to fill the Baking Mad party bags) from Amazon and Baking Mad provided the shopper tote bags and contents for the Mum goodie bags. They got a tea towel each, an oven glove each and a fridge magnet each in a branded cloth tote bag. I was given the option of having 8 or 10, opted for 10 but had 11 Mums (EVERYONE turned up) so luckily 2 of the Mums were Sisters and they shared a goodie bag. My only regret that I don't myself have a goodie bag. I thought the oven glove was far too large and would mean I wouldn't have enough grip when holding something hot (I'm now nervous understandably having dropped that cake) but I adored the tea towel and fridge magnet. The castle is good enough quality we will 100% use it again. Lottie is too young to play with it so I have dismantled it and kept it safe for when she is older. She did unfortunately get her hands on a Princess the other day as it is currently on the dining table (silly me I should have stored it somewhere high up) and she ripped her arms off. Lesson learned. You'll see how great the cupcake holder that is the castle is in action in my you tube video. Hope you have a watch as it includes lots of the party and is quite a raw video even though I did spend FAR too many hours editing it. It's quite hard to host a party and take videos/photos. Luckily at the Christening I had my friend on hand as a photographer and she did a fine job for which I'll always be so grateful. It's very easy to see how extremely proud I was of my baking in the below photo. 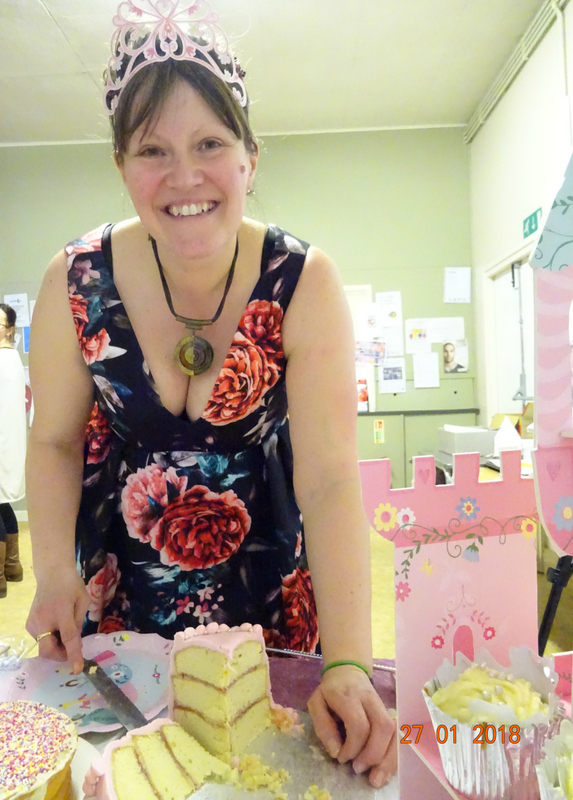 Thank you Talk to Mums and Baking Mad. It was - in hindsight - worth the stress of the extra trips to get more butter, worrying if I had enough baking tins and worrying whether the delivery would arrive before my party and more importantly how long before. 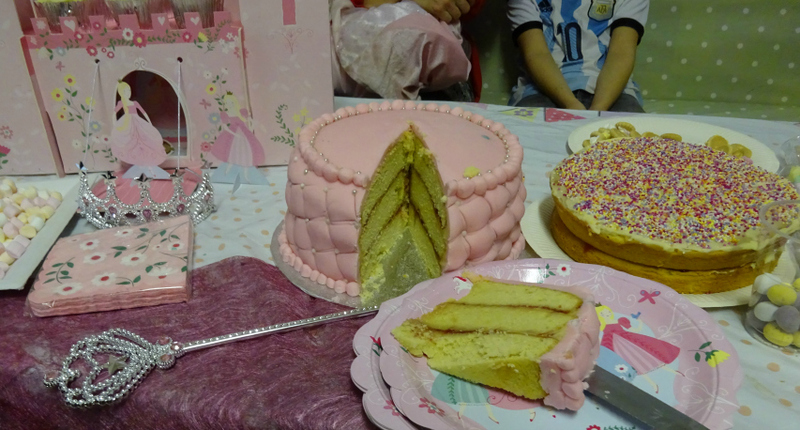 The Princess Cake really had the WOW factor when it featured a tiara and wand. 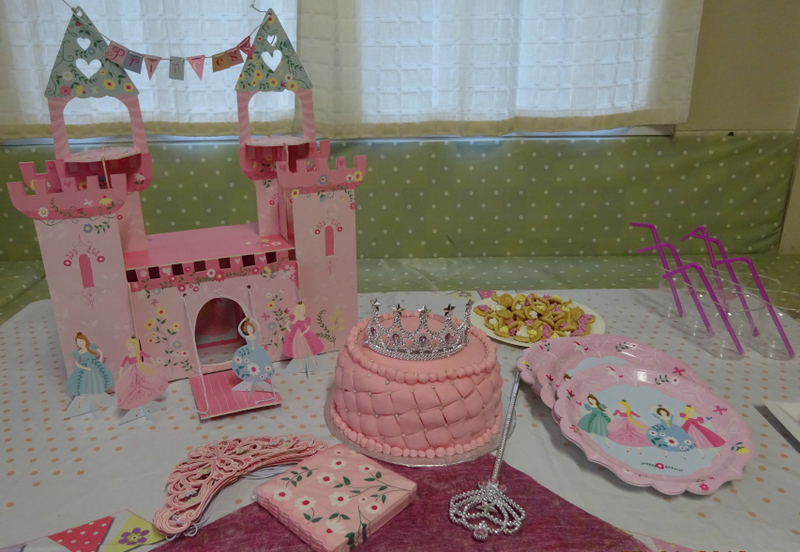 Although these no longer feature in the photography on this site nor in the cake kit, I did recreate that look with our own tiara and wand that came with my Princesses dress as accessories. As of today, the "what's included" above still says "Tiara Cake Topper" when in fact you just get edible sugar paper tiaras for the cupcakes. The cake board is thin and not as photographed. The Edible silver pearls do go white like pearls if you hold them in your hand whilst decorating the cake (the silver melts off). The silver foil cupcake cases do have the wow factor but they're very hard to split into singles when laying out for the cake mix. Despite what others have said the buttercream *IS* enough to do 2 sandwich layers AND coat the entire cake as an undercoat for the fondant icing to adhere to. My local shop only has white fondant icing so to get the pink one in this set is very handy. The vanilla extra included is premium and very potent - I think it adds to the delicious quality taste of this cake when baked. The instruction booklet will need reprinting as it still has the tiara and wand on the cover - when you do so it would be great to include photos that illustrate each stage of the process. I would never have had the confidence to drape the fondant icing across the cake had I not watched a youtube video showing how it's done. Foot note: you need to buy several packs of butter (the cake alone uses 400g and that's not including the buttercream which is a further 100g which leaves you with none to grease the 3 sandwich tins required if you bought 2 x 250g packs). That is not including the butter needed for the cupcakes. Butter and eggs are not included in the cake kit, which I think could be considered so that no shopping is required to complete the cake. You will need 2 packs of eggs as I think the cake used medium eggs whereas the cupcakes use large eggs. 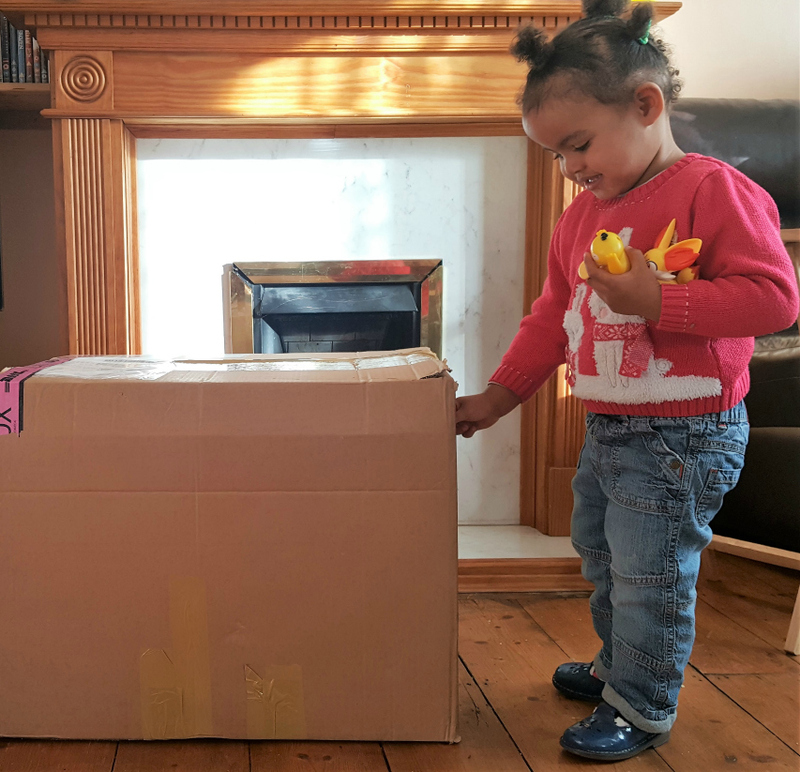 The cake kit comes in a BEAUTIFUL box with tissue paper but the individual items are not wrapped in any way to stop splitting in transit. Now I've made this cake and LOVED how it looked and tasted I wouldn't hesitate in making another so it looks like my kids will have homemade birthday cakes from now on. 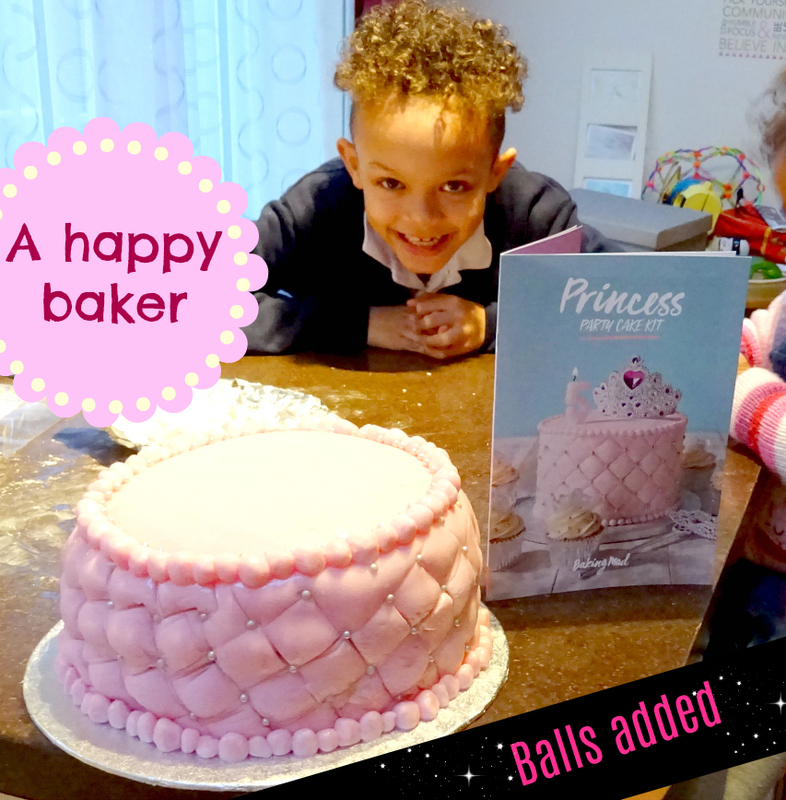 Yay I've only been a Mum for 8 years LOL and it's been shop bought till now so this has been life changing - thanks we really are now Baking Mad!